WTFast Run As Date, Why You Don't Need It Anymore? - KABALYERO - PLAY, BLOG & EARN! Home / eliminate lag / free trial / run as date / wtfast / wtfast premium / wtfast trial / WTFast Run As Date, Why You Don't Need It Anymore? WTFast Run As Date, Why You Don't Need It Anymore? WTFast Run As Date, here is why you don't need it anymore. Run As Date is a cool program because you can use it to trick another program's trial period by changing it's date. Unfortunately, it doesn't really work with WTFast. Yes, the date shown by the WTFast will change but it will still expire regardless of the number of days shown. 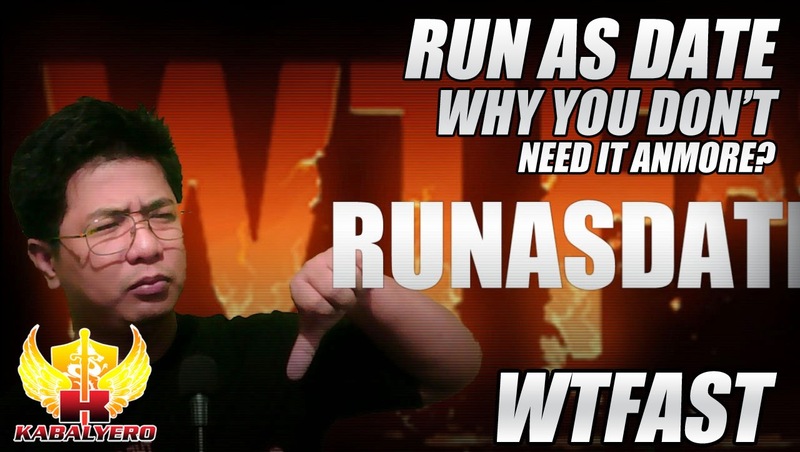 Fortunately, you don't really need to use Run As Date to extend your WTFast Trial. All you have to do is use the Extend Trial feature of WTFast and you'll receive another 14 days for FREE. Remember, the link to download WTFast for FREE is here, http://bit.ly/1dstF8t. Just click the link, download WTFast, install it and have fun using it with your favorite multiplayer online game. Now, if you think WTFast is great then you can make it even greater by becoming a Premium User. Premium Users enjoy twice the speed and a ton of features not available to Free Trial users.